The paint crew arrives to begin the task of painting every wall and ceiling in the house. 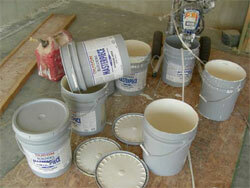 The first step of this process is putting a base-coat down over the finished drywall. All of the cabinets, tubs and showers are covered with drop cloth to prevent paint from splattering and the basecoat is applied. This process takes the paint-crew an entire day to complete, as they spray most of the paint quickly. Duron paint products are used throughout the entire house. When homeowners embark on the herculean task of painting their homes on their own, they often proceed without considering one of the most important steps, which is priming the walls before they can be painted. Many claim that priming the walls before they are painted is an unnecessary step and is merely a ploy by paint salesmen to milk more money from an unassuming customer. However, when time passes and the paint has already dried, those who opted not to prime their walls first before painting them would come to rue their mistake regretfully, as the paint which is applied to unprimed surfaces have a higher tendency of peeling, cracking, and chalking compared to those walls who were first applied with paint primer. As their name suggests, the task of paint primers is to "prime" the surfaces before they are painted with a finishing coat of paint. While primer may seem as just a mere white coat of paint for some, paint primers assure that the finishing coat of paint would adhere better to the walls or any surface on which they will be painted. This will ensure that the finishing layer of paint lasts longer and will also decrease the risk of degradation over time. Beyond the technical aspect, primers also make sure that the final output of the surface that is to be painted looks pleasing, as it makes sure that the surface will be smooth while also providing consistency in terms of color, which is also one of its primary functions. The use of primers is also highly dependent on the type of surface that is to be painted. Porous surfaces benefit highly from primers as they make sure that there would be no pores that would penetrate through these surfaces, thus avoiding unwanted stains once the paint job is finished. Most surfaces which are unfinished, such as wood, concrete, drywall, and metal are all needed to be primed before they are painted. Wood is one of the most porous surfaces and deserves special mention, because aside from creating a much-needed bond between the wooden surface and the finishing coat of paint, it also keeps the wood from rotting, thereby prolonging its life. There are cases when priming is necessary, such as when the wall that is to be painted has already been painted before and merely requires the coating of a new layer. Even if traces of deterioration on the old layer of paint are visible, then the surface is still suspect to priming before it is painted. Also, surfaces which have been previously painted with high-gloss or even semi-gloss paints, regardless of their state, should be applied with paint primers first before adding the finishing layer of paint. Priming is also needed during cases when latex paint is to be applied on oil-based surfaces or in cases where oil-based paints are to be applied on surfaces that have been previously painted with latex paint. This aforementioned example is a practical application of one of the most basic rules in elementary science: Oil and water just don't mix. Priming is indeed an important aspect of painting because it not only makes the task easier by creating and adhesive bond between the surface that is to be painted and the coating of paint that is to be applied, but also ensures that the final output looks like something that was not done in haste or by a child, but by a seasoned professional. All it takes is a trip to the nearest hardware store to buy that can of paint primer. Of course, one may still opt not to prime their walls first before painting. There will be a marked difference which cannot be immediately seen, but will only manifest itself once the paint job has been done and the walls have finally dried.